The three big German car makers (BMW, Audi and Mercedes-Benz) have developed a notable habit in recent years of finding as many product niches as possible. It was inevitable, then, that the Teutonic trio would start creating premium compact crossovers – with BMW’s offering being this, the X1. It certainly does a good job at melding together the best of both worlds: a practical and well-finished SUV with the sporting veneer you’d expect from a BMW sedan. The fact the X1 can do this at all is remarkable – but, as we’ll discuss in this review, it’s not enough to make it one of our ‘you must check this out’ cars in this class. The new X1 is a lovely place to spend time in. Quite a big criticism of the old BMW X1 was the cabin quality – here was a car with an MSRP worthy of a decently-specified 3 Series sedan, yet had interior lavishings on par with the lowly 1 Series. It was a hugely disappointing oversight on BMW’s part, so we’re especially glad to report that the new X1 is a lovely place to spend time in. Gone are those dull grey plastics; instead, we have lots of high quality soft-touch plastics and a piano black gloss surround on the center console, with the silver accents adding a dash of colour to an otherwise rather monochrome cabin. Plus, unlike the previous car, the BMW X1 gets a multimedia screen as standard equipment, meaning more buttons can be removed from the dashboard (thus leaving a cleaner and less cluttered layout) and re-assigned to the iDrive interface that, we feel, is the easiest to use when stationary and on the move. It also helps that the 6.5inch display is crisp and, as it’s perched high up on the dash, is easy to quickly glance at whilst you’re driving. It’s still not amazing, but rear seat accommodation is now far more agreeable on the current X1. Rear space was quite a big concern on the old X1 too, so again it’s pleasing to see BMW’s sorted things out on its second attempt. It’s still not amazing, but rear seat accommodation is now far more agreeable on the current X1, with decent head and leg room available to all but the tallest of passengers. Likewise, the trunk is fairly commodious, thanks to its boxy dimensions and generous-by-compact-SUV-standards 17.8 cubic feet rating (considerably more than, say, a Nissan Juke’s 10.5 cubic feet capacity) – plus, the 40:20:40 split-folding rear seats give you more flexibility, especially if you need to simultaneously carry extra passengers and a whole heap of luggage. Of particular note are the storage cubbies dotted about the cabin. Though they’re certainly nothing new to the compact SUV class, we are impressed by the quantity and usability of them. All of the door bins can comfortably contain a decent-sized bottle of water, the glovebox is of a good size and there are two cubby slots in the center front armrest. It’s very impressive stuff, and particularly handy if you’re the sort who takes lots of gadgets, gizmos and whatnots with them on car journeys. This BMW is certainly head and shoulders above almost everything else in this class when it comes to behind-the-wheel entertainment. A lot of fuss was made about the current BMW X1 being based on the same sort of platform architecture that underpins the latest Mini models – especially when you remember the original X1 was based on the chassis of the previous-generation 3 Series sedan. 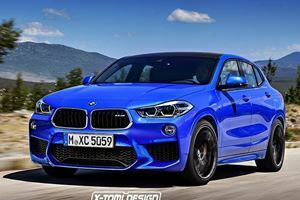 Even more fretting was mode when BMW USA revealed all X1s sold in the States would only come with an all-wheel drive system that sends most of its power to the front wheels, which was the direct opposite of what the old X1’s all-wheel drive setup did. You needn’t worry about such things, though. Not only do they not mean much to a majority of BMW X1 buyers, but this drivetrain switch around hasn’t had a huge impact on the way this SUV drives. Those who expect pin-sharp driving responses will be disappointed (there’s a little bit too much body lean and understeer in the corners for the X1 to be truly fun to drive), but this BMW is certainly head and shoulders above almost everything else in this class when it comes to behind-the-wheel entertainment. 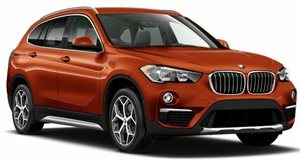 Essentially, if you’ll rarely take your BMW X1 out on the highway, you should be very content with how hushed and refined your car is. 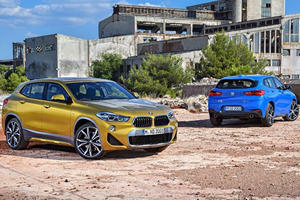 Having that slightly softer edge has resulted in the BMW X1 being a far more resolved and well-mannered SUV in normal. It can be a noticeably fidgety over lumpier surfaces (all X1s sold in the States only get the sports suspension kit – even though it’s an optional extra in almost every other territory the BMW is sold in! ), but the rest of the time the car rides smoothly over the road surface; filtering out grainy imperfections in the road surface remarkably well, in spite of the 18inch, low profile run-flat tires. Those big wheels do generate a fair bit of tire roar at higher speeds, though. However, that is combated somewhat by the otherwise impressive noise insulation levels on offer everywhere else, with wind noise being exceptionally well suppressed by compact crossover standards. Essentially, if you’ll rarely take your BMW X1 out on the highway, you should be very content with how hushed and refined your car is. As with its contemporaries from Audi and Mercedes-Benz, the BMW X1 only gets a 2.0-liter turbocharged four-cylinder gasoline engine. For all the premium German car makers’ collective and eternal pursuit for product niches, they don’t really offer a wide variety of engines in their cars. 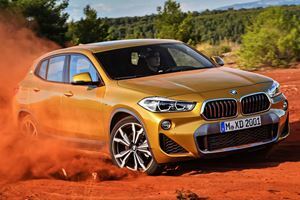 As with its contemporaries from Audi and Mercedes-Benz, the BMW X1 only gets a 2.0-liter turbocharged four-cylinder gasoline engine – which, like its equivalents, is a pretty good all-rounder. You certainly can’t be too upset with its potency. With claimed outputs of 228hp and 258lb/ft of torque, it’s certainly a very strong engine, with the bountiful mid-range urge in particular being useful when you’re getting the X1 up to speed. Such pace is also helped by the eight-speed automatic transmission, which changes gear swiftly and smoothly, regardless of what driving mode you’ve selected or whether you’re changing gears manually instead of leaving the auto to do its own thing. Getting the BMW X1 up to speed also means you’ll quickly avoid the only major drawback with this engine: its overall refinement levels. Getting the BMW X1 up to speed also means you’ll quickly avoid the only major drawback with this engine: its overall refinement levels. From start up and when you work it hard, the engine note can be quite coarse (which is surprising, given many other BMWs with similar engines don’t suffer from this nearly as much) – though, once you settle down to a cruising pace, the 2.0-liter engine does become considerably more hushed. Put simply, as long as you keep the revs in between idle and the top third or so of the rev band, you shouldn’t encounter too many issues with the BMW X1 regarding engine refinement. Doing so will also mean you’re more likely to hit the claimed economy figures for the BMW X1: you should be able to hit 22mpg and 32mpg on the city and highway respectively in this car. And, as they are on paper, they’re not too bad – it’s about on par with what many cars in this class can return (often with smaller engines, no less), and it’s far better than the 20/28 mpg that’s attainable on an Audi Q3 when fitted with all-wheel drive. That being said, a like-for-like Mercedes-Benz GLA does pip the X1, with its claimed 25mpg and 35mpg economy figures. How can the BMW X1 be so well-rounded in so many places, yet still fail to reach recommended status? It’s simple: the car is incredibly expensive. It also seems too good to be true, right? How can the BMW X1 be so well-rounded in so many places, yet still fail to reach recommended status? It’s simple: the car is incredibly expensive. Possibly influenced by the ‘standard fit here, optional extras everywhere else’ spec level, the BMW X1 price list starts at a rather considerable $35,795 once delivery charges are added – meaning this German compact crossover in its most basic guise costs more than a top-spec Jeep Renegade with every optional extra fitted – and still have change to spare! In spite of this premium, though, the BMW X1 is devoid of the creature comforts you’d probably expect to see on a $35,000+ car. Leather seats, for instance, are a $1,450 optional extra, and you’ll need to fork out $550 for the Cold Weather Package if you want heated seats. Perhaps the biggest sin, though, is the fact the reversing camera is it locked behind a $1,150 Driver Assistance Package pay wall. Not only is it almost a necessity in a car with rear visibility as limited as the BMW X1, but reversing cameras are standard equipment on every variant of the Nissan Juke (a car that, less we forget, has a starting price of just over $20,000). All X1s do come with a decent amount of features, such as dynamic cruise control, hill descent assist, a power tailgate and climate control. Thankfully, that’s where BMW’s stinginess appears to end. All X1s do come with a decent amount of features, such as dynamic cruise control, hill descent assist, a power tailgate and climate control. One feature that especially caught our eye, though, was the BMW Assist eCall device – if the system detects a crash has occurred, it sends the car telemetry and location to the nearest BMW call center, which will in turn transfer those details to the local emergency services. It’s very impressive stuff, and we’re pleased to see BMW’s fitting it as standard on the X1. Having a stupidly expensive array of options does mean you can cut back on loads of expensive fripperies – the leather trim and Driver Assistance Package are the only ones we mentioned earlier that we’d definitely recommend, as they’ll make the BMW X1 more useful on a day-to-day basis and help bump up the car’s residual values. We’d also highly reckon you should consider the $300 sliding and reclining rear seat arrangement, given it’s relatively inexpensive and handily increases the rear usability (for instance, you can slide individual chairs backwards to improve leg room, or slide the entire row forward to increase the trunk space). If the BMW X1 were a cheaper car, we’d happily place it higher on our ‘compact crossovers to recommend’ list. By class standards, it’s quite practical, efficient to run, pleasant to drive and has some of the best residual values you’ll find in this segment. All that really holds it back is a slightly stingy standard spec list – which, in turn, is exacerbated even further by that steep MSRP. Assuming you’re looking primarily at the premium end of the market, then we’re more inclined to suggest an Audi Q3 over the BMW X1 – and, if you’re open to more mainstream alternatives, the likes of the Fiat 500X will Mazda CX-3 are even easier to recommend. The new X2's base price is nearly $5k more than the X1's. It won't be a full X2M, but it should still be pretty fun. Yep, BMW's lineup just got even bigger.